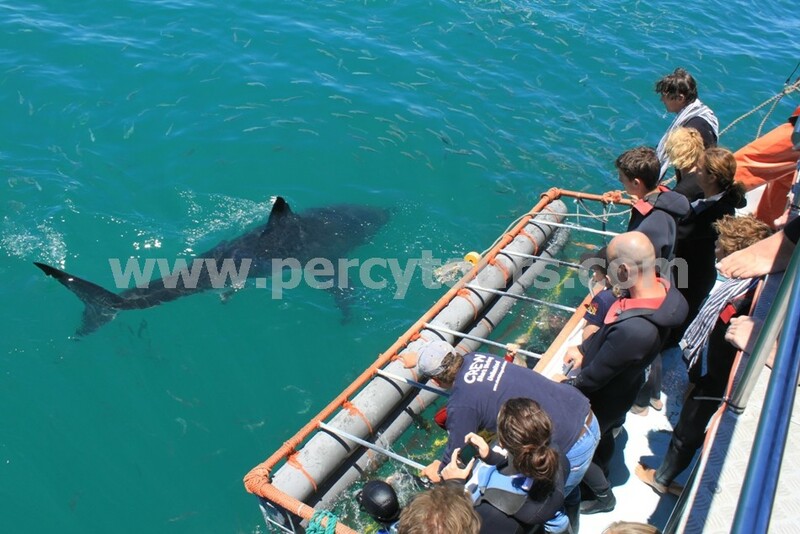 If the micro-light wasn’t to get my adrenalin totally fired up, then Great White Shark cage diving was about to blow my heart beat utterly sky high. Percy calmly explains that this is a very safe experience and that many famous people have part-taken in this high octane activity. If Prince Harry, Brad Pitt or Barbara Windsor can do this, then I can too. 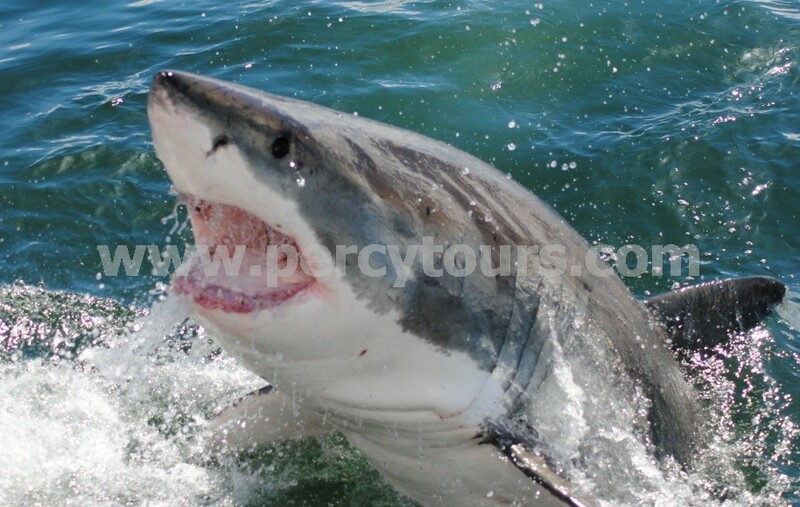 During the 45 minute journey from Hermanus to the harbour at Gansbaai, pronounced Hansbaai by the way, Percy chats non-stop about Great White Sharks, how they are not the frenzied man eaters that the hyped media would lead you to believe, what their characters are like, what their behaviours and preferred habitats are, what they really like to eat (thankfully not humans as we are too crunchy for them), what the research organisations have found out and many other amazing facts. Despite being more informed I nevertheless gingerly climb onto the boat and it isn't long before I am zipping out to sea with 10 other excited (and slightly apprehensive) tourists. 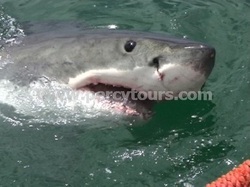 I throw on a wet suit and a mask and within minutes our first Great White Shark slowly swims into view. And my oh gosh, are they swimming slowly with purpose to investigate that bait on the end of the rope? This awesome creature is so incredibly pretty, even if it does look like it’s constantly smiling a sinister smile at me. 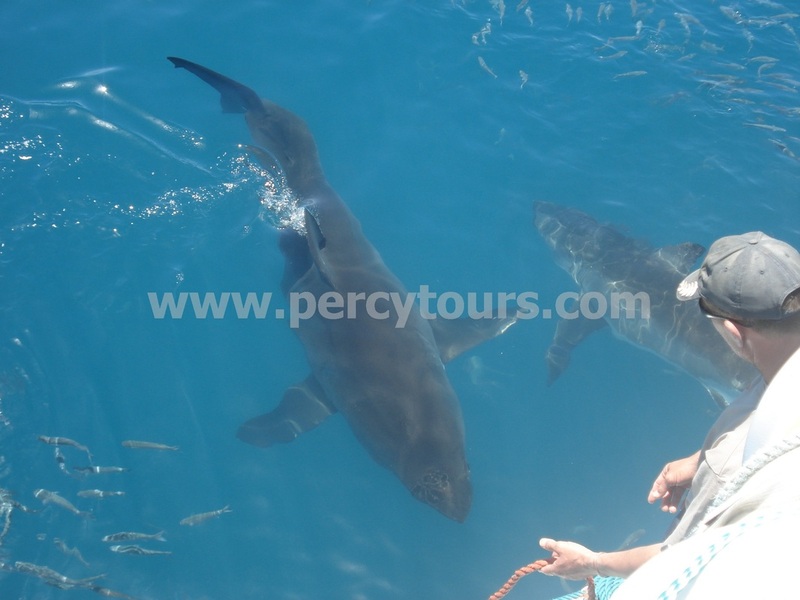 I jump into the cage and a big great white shark comes swimming by me about a metre away. It seems to be drifting by me for ages, or is that my imagination playing tricks on me, saying that this shark is enormous? I re-surface to let out an excited scream of wonderment, while smiling like a Cheshire cat who has just had all the cream. This is brilliant! Please don’t order me to get out of the cage. I know its cold in here, but I am having the time of my life. All the other divers do get their turn and then it is time for my second dive. This time I am allowed a much longer submerged encounter. My under water camera is clicking away as the sharks swim by. After 4 hours and 4 dives I am higher than any kite and arrive back at the harbour so overjoyed that Percy can’t stop me talking about what I have just experienced. He smiles back at me knowing that I would return elated. “Please can I do that again?” I shout, beaming a huge smile.